A trip to the West Cork Literary Festival turns into an unexpected and inspiring look at Bantry Bay and the people who call it home. In the words of Man Booker Prize-winner Anne Enright, “Ireland is a series of stories that have been told to us.” For me, Enright’s words couldn’t have rung truer. 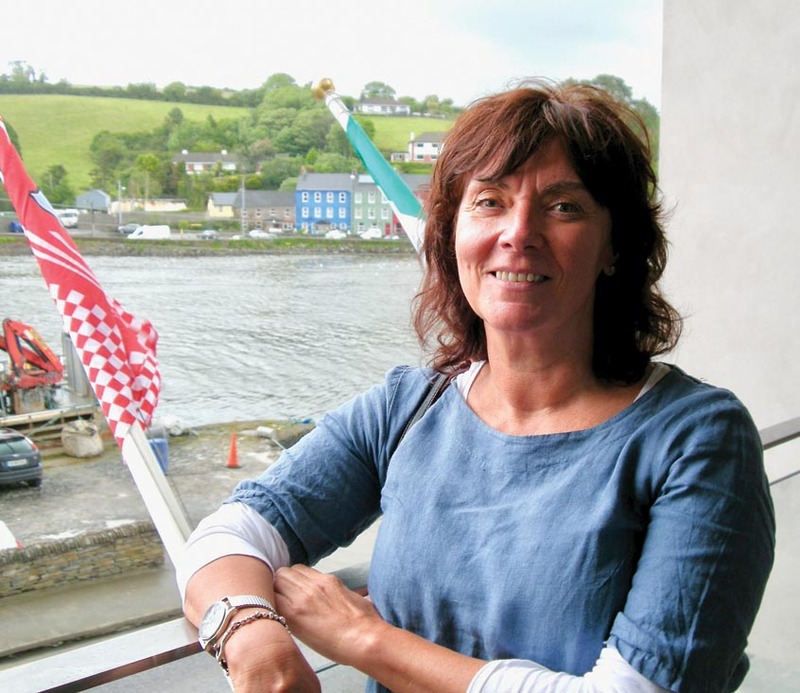 My father’s stories of growing up in Country Cork, told to me as a child, had the power to transport me to a time and place that I only knew in my mind until I arrived in Bantry for the West Cork Literary Festival in mid-July. Bantry did not disappoint, and neither did the festival. 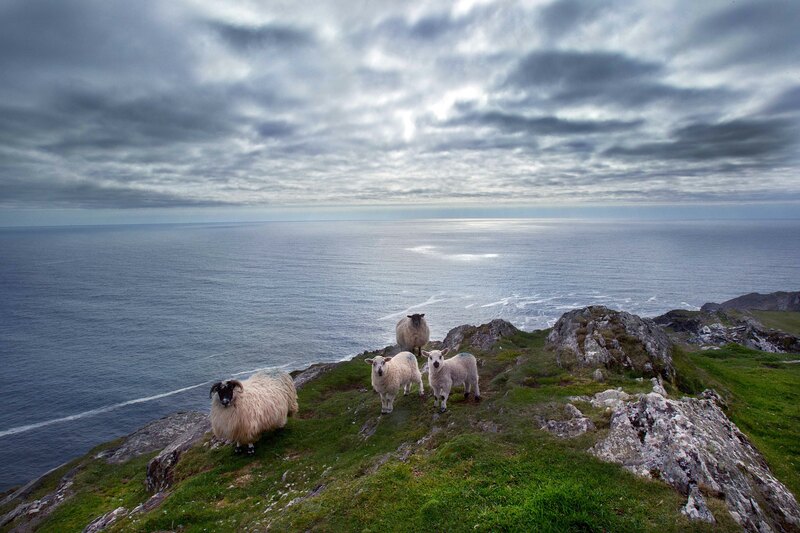 The town is nestled on the coast, at the head of Bantry Bay, and the scenery is stunning in all directions – the Beara peninsula is to the northwest, with Sheep’s Head also nearby, on the southern peninsula. 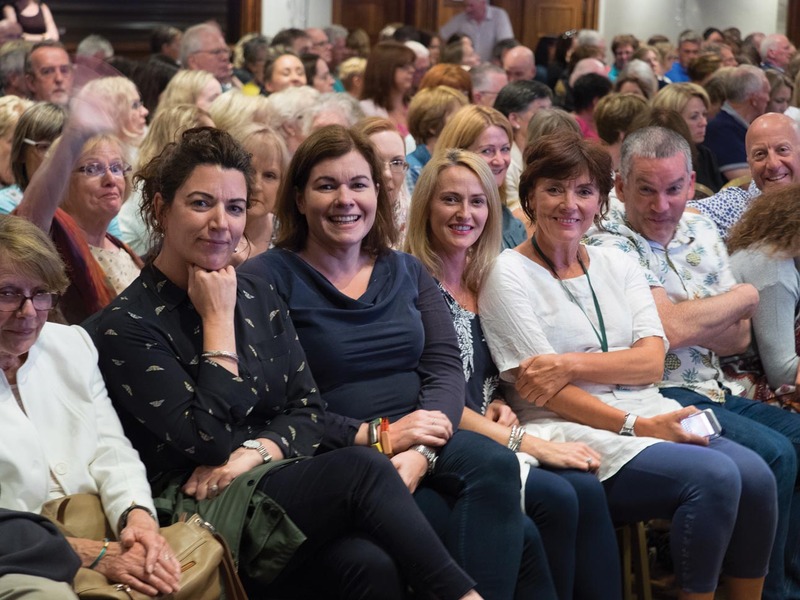 The festival provided a week of endless literary talks, poetry readings, music, theater, and countless opportunities to meet great writers such as Enright, Colm Tóibín, John Boyne, and Eimear McBride, as well as fellow book lovers, artists, and thespians. All this in a splendid setting so beautiful that it has been designated part of Ireland’s Wild Atlantic Way. 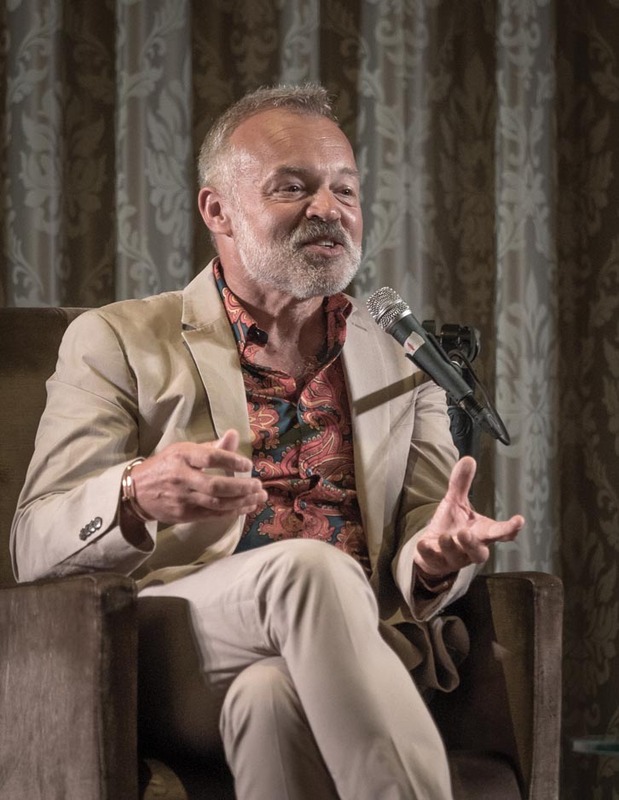 One of the most enjoyable events of the festival was when BBC talk show host (and native of the nearby Bandon) Graham Norton read from Holding, his debut novel on small town Irish life, and proved during his Q&A that he could dazzle a crowd just fine on the other side of the mic. Irish Times Paris correspondent Lara Marlowe, meanwhile, elicited gasps and debate with her recollections of the horrors she has witnessed in her time as a wartime reporter in the Middle East; and in the autobiographical category, there was acclaimed South Korean violinist Min Kym, who told the highs and lows of her life story as a musical prodigy devastated by the theft of her instrument in Gone: A Girl, A Violin, a Life Unstrung. 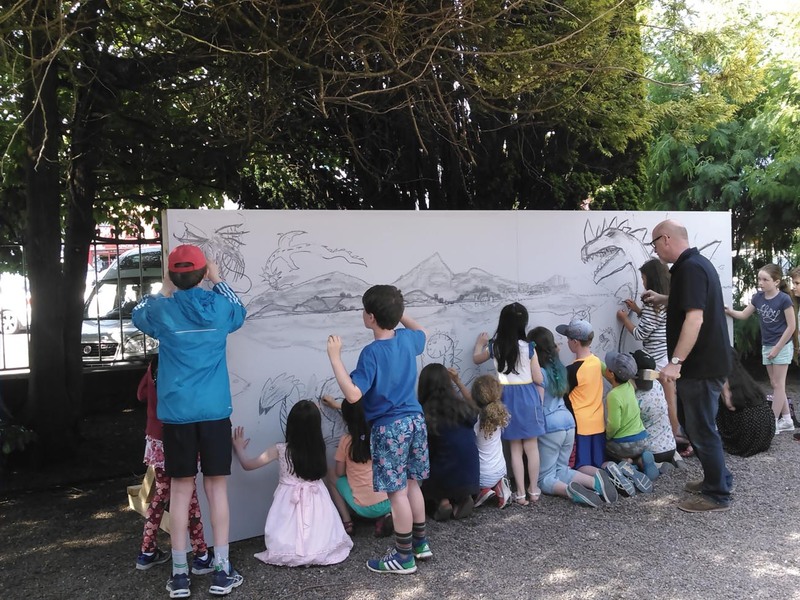 If, like me, you are charmed by the discipline of children’s fiction, you might like to know that all were welcome to join younger patrons of the festival in an impassioned discussion with Jane Mitchell, author of Syrian refugee story Without Refuge, or enjoy the sunshine in the yard of St. Brendan’s National School while painting a thirteen foot-long dragon mural, overseen by children’s storybook illustrator P.J. Lynch, Ireland’s current Laureate na nÓg, or Children’s Laureate. The festival made full use of the town’s amenities, including Bantry’s Maritime Hotel, the event’s home base for the week. The hotel is managed by Fionnbar Walsh (whose own book, Donal’s Mountain, tells the moving story of his son’s battle with cancer) and played host to several events each day, frequently double-billing highlight authors such as Sara Baume and Lisa McInerney to incite a juxtaposition of literary techniques. Baume, for example, noted that she could “write a whole novel without dialogue if it was possible,” whereas McInerney would happily write one that featured nothing but character back-and-forth. The Maritime continued the fun with nightly open mic sessions, emceed by journalist Paul O’Donoghue for festival attendees and tourists alike. Other events brought literature aficionados to the enchanting Bantry House, a well-maintained manor constructed around 1700, with a much-lauded seven-terraced garden that served as a dazzling backdrop for many an afternoon’s conversation, one of which featured weaver of feminist fairytales Marina Warner, who emerged, oh-so-fittingly, from a hidden passageway to begin her Q&A. The festival also spread its cheer to the local library (an architectural wonder set atop a moving watermill at the top of the high street), which, one afternoon, hosted a reading by American authors Dean Bakopulous and Alissa Nutting, a married couple whose novels are both concerned with the disintegration of relationships; their own, they assured the audience, did not serve as inspiration. 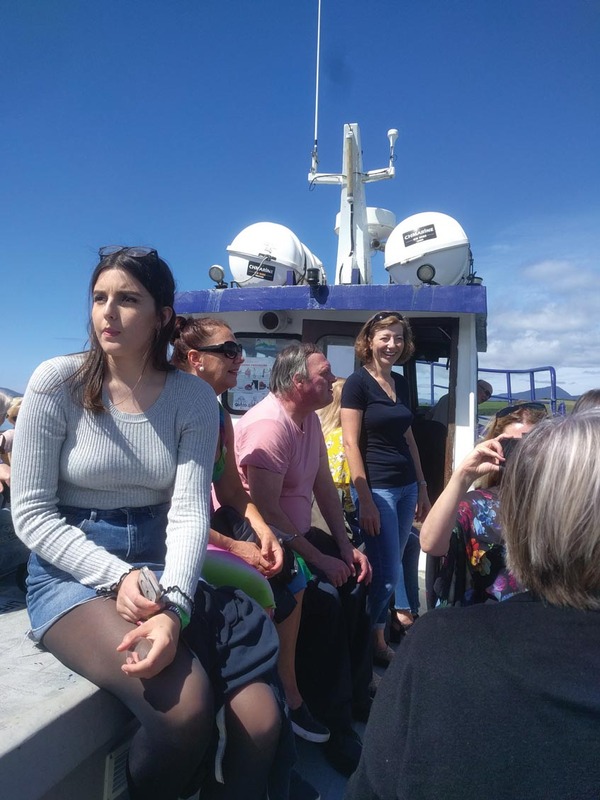 One of the festival’s most popular events, Emma Jane Kirby’s reading of The Optician of Lampedusa, took place on the LÉ Samuel Beckett, a ship deployed twice in the Mediterranean in 2015 and 2016 and responsible for the rescue of over 4,000 migrant lives, docked for the day in town. 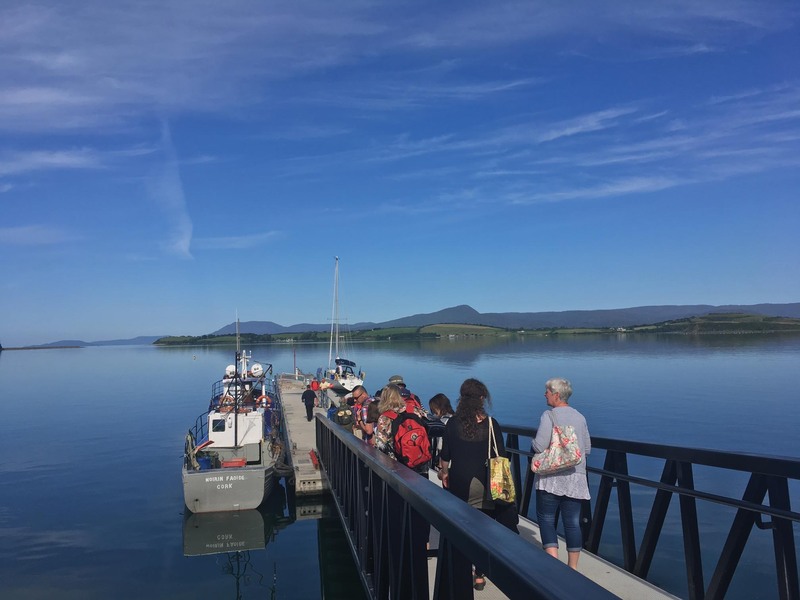 Just off Bantry’s shore is the storied and beautiful Whiddy Island, a roughly triangle-shaped piece of earth brimming with gentle hills and fertile land that takes up much of the eastern head of the bay, buffering the town from the harsher bay weather. It is currently home to some 30 islanders, though prior to 1880, the number was closer to 450. As most islanders own boats for the ease of mainland visits, fishing has always been Whiddy’s signature trade. During the Napoleonic era, English forces constructed batteries on the island to prevent a repeat of the 1796 storming of Bantry Bay by the French, accompanied Wolfe Tone (for whom Bantry’s town square is named), in an attempt to free the Irish from British rule. In the autumn days of World War I, Whiddy served as a U.S. naval air station. Today, the island hosts a large oil terminal that dominates its southwest corner and is home to Ireland’s strategic oil reserves. Despite its diminutive population, Whiddy Island is no reclusive, water-locked hamlet. Connected to the mainland by a small local ferry, Ocean Star III, its peaceful shores and pastures draw in many a visitor, particularly during the summer months. The very night before my tour with Tim O’Leary, islander and owner of the island’s sole pub, the Bank House, it hosted the West Cork-based Fit-Up Theatre Festival’s opening night with a play called Sharon, the story of an Irish woman’s search for a life of her own in her conservative hometown. The play brought in theater lovers aplenty, many of whom lingered at the Bank House for a pint after curtain. Whiddy was also the very appropriate location of Wanderlust magazine editor Phoebe Smith’s five-day travel writing workshop. Walking tours, guided by Tim, are also a strong draw to the island. They offer a chance for both tourists and locals to get active while learning about the island’s intricate history and culture in ways precluded by reading about it, online or elsewhere. Easily bypassed without an insider’s knowledge, for example, is the island’s coffin stone, inlaid into a jetty where islanders traditionally rest the casket of one of their own before the body is ferried to the mainland. Past the island’s western strand is Bantry Bay proper, one of several long, slender bodies of water on Ireland’s southwest coast that look as if someone had dug their fingers into Cork and Kerry 30 miles inland and scraped away the earth underneath. It separates the Beara Peninsula to the north and Sheep’s Head Peninsula to the south, the latter of which I was lucky enough to steal a morning to explore alongside West Cork Music CEO Francis Humphry, a resident of the nearby village of Durrus. Perhaps it was the way that the Literary Festival was igniting my imagination with new ideas at every event I attended, but as we drove up the green, crinkled hills to reach the nose of the peninsula, I could have sworn we moved along the skin of a slumbering green giant, at rest so long that wildflowers had claimed his hulking form as home. 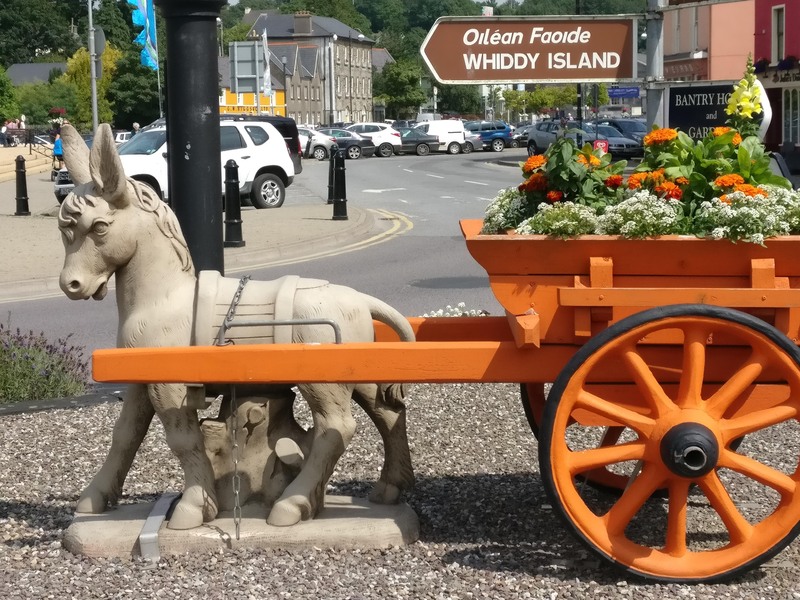 Francis was quick to supply the flowers’ formal names as I marveled at the variety – meadowsweet, oxbow daisies, and honeysuckle, which I was happy to recognize as one of the flowers carted by the statue of a small donkey in Bantry’s Wolfe Tone Square. Also familiar to me was the spiky, fire-orange montbretia, which Francis informed me was a foreign species. Despite this, I remembered it too had a home in the donkey’s cart, growing proud and vivid for the town to see. Pausing often to take in the rugged loveliness, the peninsula and be carried away by the walloping echoes of ocean on cliff, we eventually reached the tip of Sheep’s Head, and an entrancing view like none I had experienced yet. Looking out onto the endless stretching horizon where sea met sky, soaked, in the words of poet Eavan Boland, in the “hard shyness of Atlantic light,” I thought of America, invisible, somewhere beyond my line of sight, a world away. As a pair of thoroughly unfazed sheep rambled by, I had to laugh at their timing. The West Cork Literary Festival was, according Francis, “born from the arms” of the West Cork Chamber Music Festival (which was held the first week of July this year), a provider of top-class master class programs, student concerts, composition workshops, and an array of Bantry-based pop-up events since its own genesis, in 1995, as an arrangement of performances during the bicentennial celebration of St. James Church just outside of Bantry, a site still utilized for the festival’s musical showcases today. Like the Literary Festival, the Chamber Music Festival continues to attract more lovers of the arts each year, its status as one of the largest chamber music events in Europe necessitating the committee’s current fundraising plans for the construction of an official venue for festival performances. The music hall, development consultant Deirdre O’Donovan told me, will serve the Bantry community in other capacities during the off-season, and will allow the West Cork arts scene to soar at entirely new heights. Aspiring travel writers line up to take the Whiddy ferry on the first day of a five-day workshop. The Literary Festival began in 2000 after the Chamber Music’s annual congregation began to attract artists beyond those musically inclined. Poetry readings and writer’s workshops were soon in such demand that establishing a yearly tribute to the world of words was the only logical step. It has thrived ever since, and if the excitable crowds gathering before each event to secure the best possible seats were any indicator, the momentum shows no signs of dropping off. Before returning to Bantry to rejoin the excitement of the festival, Francis and I paid a visit to Durrus Cheese, a family business located by the valley of Coomkeen, about five miles west of Bantry, that approaches its fourth decade of providing artisanal cheese made from local milk. Cheese maker Sarah Hennessy gave me a tour of the facilities, teaching me about the unique West Cork cultures with which the family’s cheese is washed to give it its distinctive pink rind. The company’s cheese making process was developed by Sarah’s mother, Jeffa Gill, who brought home a gold medal from one of the first Irish Farmhouse Cheese competitions in 1984. Suffice to say that after sampling the classic Durrus cheese, the softer Durrus Óg, and the hard, mature Dunmanus version that the family produces, the many national and international awards they have continued to claim over the years came as no surprise to me. The village of Durrus is also home to another family business of a very different style. For 30 years, the natural beauty of this area has stoked the flames of inspiration for the Cronin family, who operate Cronin’s Forge, providing handmade ironwork in the form of everything from candleholders to exquisitely crafted garden gates. A strong Celtic influence is clear when one examines the Cronins’ creations, and I was invited into their workshop to observe the forging process. The lines of Seamus Heaney’s “The Forge” came back to me: “Inside, the hammered anvil’s short-pitched ring / The unpredictable fantail of sparks / Or hiss when a new shoe toughens in water.” As I watched the masters at work, I recalled that in the poem Heaney never actually sees the forge’s interior, instead evoking an imagined scene from the sounds of the blacksmith at work. He had it so right. Wrangling words for one week straight can prove quite the mental workout, so it was fortunate for all festival-goers that Bantry’s many restaurants were up to the challenge of refueling that brain power. Fresh seafood dishes were plentiful and beyond compare, and I came away from each meal a degree more convinced that, fulfilling the old “you are what you eat” adage, I’d soon find myself growing gills. In O’Connor’s Seafood Restaurant, pan seared hake was complemented with a bright swirl of butternut squash and smoked sundried tomato purée. The crab cakes served up by the Fish Kitchen, a tiny, intimate spot tucked above a real fishmonger’s, were delicately formed but packed a flavorful punch. Only in chef Christian Barcoe’s Donemark West was I tempted to depart from the bounty of the bay to enjoy a perfectly prepared breast of duck, courtesy of one of the nearby farms. Deirdre O’Donovan, development consultant for West Cork Music Ltd.